Rachelle isn’t even 24 hours old and she already has these funny little quirks. She likes to have her legs straighter than most newborns. She doesn’t like to burp, in fact the first time she actually burped she scared herself. She can actually keep a binky in for a good amount of time and usually when she spits it out, is when she is done with it. We thought she was going to be a wailer when she was born, but she is mostly a complainer. A blessing is that she slept through the night last night. I had to wake her to feed her. Hope she keeps this up. Baby Rachelle arrived at 12:49 this afternoon. She is 7 lbs even and she is 18 inches long. After Dr. Craig got me open to my uterus she told us that it was a very good thing that we upped the c-section, my uterus wall was dangerously thin. She had a hard time stitching it back together, but she was able to do it. She told me that if we are to have more children we need to wait a while before we do. I told her that it will be at least 3 years before I even think about another one. Rachelle came out screaming and I think she must have got it out of her system because she was relatively calm until her first bath. She is a good little nurser so far. She is also my chubbiest by far and the shortest. Once we were settled in the recovery room, Eric went out and got my parents so they could come back and see her before they had to leave. They left for Portland than Europe for a month today. Eric’s parents had the older 2 girls. They took them out to eat at McDonalds and arrived at the hospital after we had been moved upstairs. Rachelle really likes Sammie. This one has been the hardest so far. I am so nauseous that I am having a hard time keeping any food down. I was up at 4 am this morning and I am exhausted, but sleep doesn’t want to come, at least not a deep sleep, I will zone out and doze, but not for very long periods of time. It is a good thing that God lets you forget what this is like because I would have been done with Emma. They just got me up to walk for the first time a little while ago. I had forgotten how much it hurts! All in all, I guess it is not too bad, I just need time. Today is the day we are going to have little Rachelle. 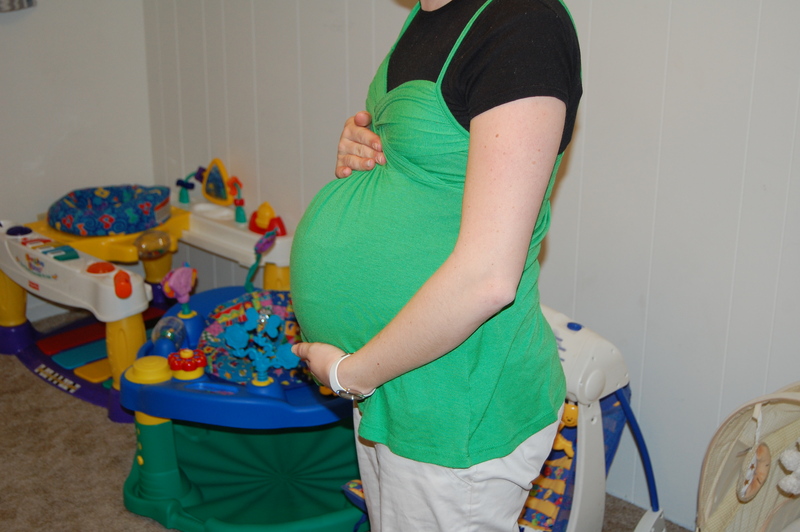 Eric is predicting that she will be 8 lbs 1 oz and 22 inches long. He also thinks that there is no way she will be under 7 lbs. My friend Naomi at work says 6 lbs 2 oz and 18 inches long. No way she will be that short. Sammie was just under 6 and still 19.5 inches long. As for me, I am just trying not to think about how hungry I am. I can’t eat anything until after my surgery. So cruel to a pregnant woman. Besides holding this little on in my arms, I am most looking forward to having her off my sciatic nerve! It has been a rough couple of weeks. We will post later with pictures of our new addition. It is finally Spring in Logan. We were very productive tonight. Well Eric mostly. 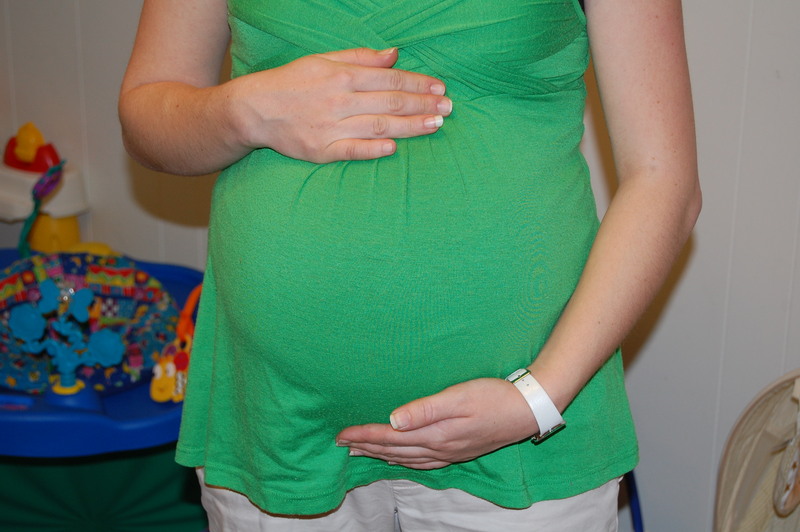 I saw my doctor today and I am now officially on Maternity Leave. Maybe the swelling will go down if I am not on my feet so much. No it’s not affecting my blood pressure or anything like that I am just swollen and exhausted. I have also been contracting off and on for the last 4 days. Eric ripped out half of what needs to be ripped out in order to mow in the back yard. He borrowed a mower from one of our home teachers and was able to get the front yard mowed and weed whacked. Our front yard no longer looks like white trash. Emma helped me plant the cucumbers, tomatoes and pumpkins out back. Monday morning we woke up to Samantha without a diaper on. She had wet the bed as well. This determined that I would be starting with the pastel laundry this morning since we only have one set of sheets for her bed. I was down stairs switching out a load of laundry when I heard an enormous crash with some bangs associated. I run up the stairs to Sam’s room and I can’t see her, but she is sure wailing. There is a dresser on top of her. 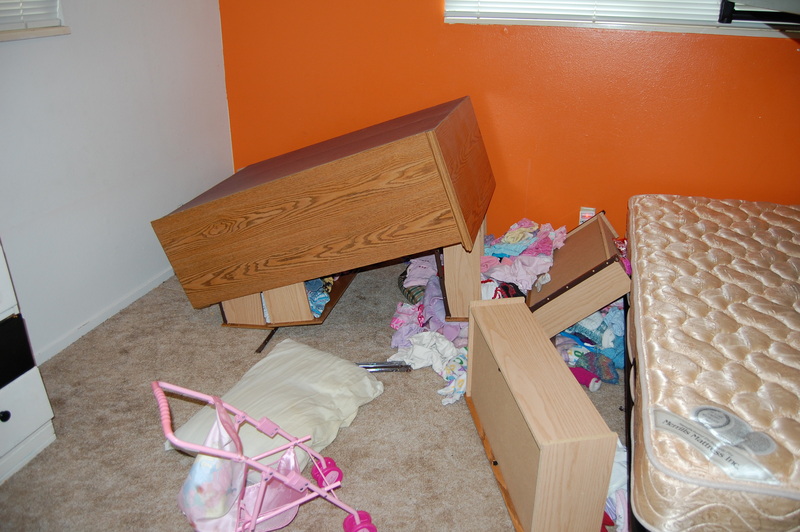 I lift the dresser and pull drawers off her, pull her out and let the dresser fall to the ground again. I call Eric in a panic and tell him to come take us to the emergency room. He rushes home and picks us up. I called Bill to pick up Emma from school, then call the school to let them know that Bill will be picking her up. Here she is in her hospital gown. The doctor examined her and thought that there was no worry for internal injuries or neurological problems but they wanted to observe her for a little while and see if she could keep food down. So she got a popsicle. After she proved that she could keep food down they let us go home. When we got home I took a picture of the dresser. This was after the fact. It is standing up now, but needs to be repaired before we can use it again. Bill brought Emma home shortly after we got home and got to work. He put the bolts in the top bunk so it no longer had to be secured with rope. Then he inspected the dresser to find out what was needed to fix it. A few of the drawers broke when it fell, but they seem to fixable. 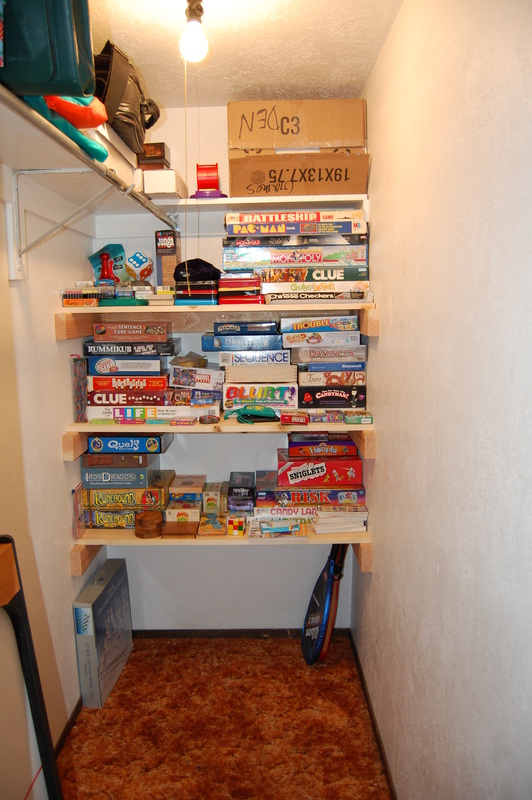 Next he built my shelves in the den closet. Eric and Emma unloaded the boxes of games onto them and look , there is still room for more underneath, 3 boxes to 3 shelves. There, now no one can say I didn’t do them. Yes I really hate pictures of me when I am pregnant. It’s that time again. It always falls the same week as the Gardner’s Market Orientation and my ride had to be there too, so we were a little late. We missed the first part of the sale but I still came away with a pound of gorgeous grey roving and a pound of luxurious white! Both will be an absolute dream to spin! I didn’t have my camera ready so I missed the candid picture taking of the Skirt Scramble, but Bill and I stuck around to watch them feed the bum lambs. Bill even got to feed one.